Visit any playground in any city in Australia and you’ll probably see rows of identical scooters and pushbikes parked along the footpath. Parents pick carefully through the tangle of vehicles, wishing they’d remembered to stick a name label on their kid’s scooter. 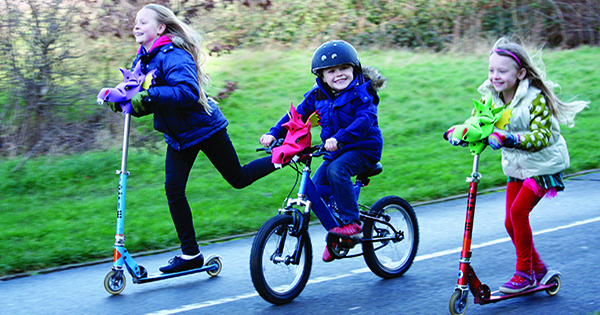 Handlebar Heroes sets your child’s wheels apart from the crowd with its awesome animal head masks. Bikes and scooters transform into horses, magical unicorns, fierce dragons, or whatever little imaginations can dream up. Each Handlebar Hero has a backstory, like Princess Flowerbell (£12), a white unicorn with stickers for decorating and a penchant for strawberry milkshakes, or Infernious (£12.50) the red dragonasaur who loves playing rugby in the rain. Just when you thought your kids couldn’t love their wheels any more, a Handlebar Hero is sure to inspire hours of play and guarantee that you won’t be able to pry the scooter out of their hot little hands. Handlebar Heroes is based in the UK and will ship internationally if you get in touch.